On Aug 1st, 2011 we lost a ‘son’ to my mom, a ‘little brother’ to my sister and I, and a buddy to my dad. I can’t wrap my head around the proper words to express the grief my family and I have gone through over our loss, but I will do my very best. My baby had just turned 8 years old…he celebrated his last birthday at the vet while trying to get treatment for his kidney failure. I can go on and write about the pain and suffering he had gone throughout the past few weeks. However, all his good memories over these past eight years outweigh the hardship we all faced WITH him - his pain was our pain. Our Toocie was a fighter, from the very first day we brought him home until his very last few breaths with us. I will never forget that afternoon when we went to bring him into our lives for the first time – Sept 6, 2003. There was heavy rain & dark clouds forecasting the sky. It seemed almost impossible to step foot outside – that very day, Hurricane Isabel had hit the city hard, but for some reason, nothing seemed to stop us from bringing our baby home. 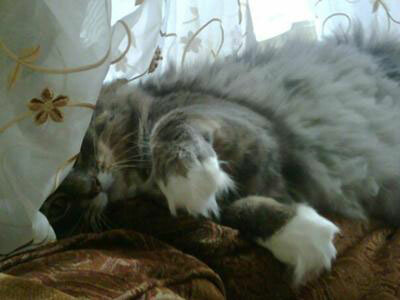 We named our cat ‘Toocie’ because of his elegant shade of grey, in Farsi, the color grey denotes his name. We have a very small family, no more and no less than four members. But the day Toocie entered our lives, we officially changed that number to five. Each one of us has our own story as to how we bonded with our baby… this message is for you my family, to let you know that without you, there was no Toocie to begin with… you picked him up and breathed life, love and happiness to him each and every day. He loved the way she would kiss his very gums, and let him smell her bowl of cereal every single morning. He would run to her every time she had bags in her hands or circle around the tree as we decorated it with ornaments every Christmas. My bubs holds her emotions strongly to herself, and I know it’s hard for her to let it out at times… just know that whenever you are alone the next time you feel like bottling something up, Toocie is sitting right next to you, purring and comforting you with his big round eyes. Thank you for always capturing all the perfect moments of him on camera… his memory remains because of you my beautiful sister. To the one man who would sacrifice taking him to the vet, even though he knew the consequences would mean a grumpy few weeks with Toocie’s ‘crankiness’. If there ever was a time we needed entertainment, all we had to do was watch them both have their moments playing together on the floor. And as many times as my mom would yell ‘stop, you’re making him mad', deep down we knew Toocie was loving every bit of those moments. Looking in his eyes, you could feel the appreciation he had for my dad… Toocie knew the deep love my dad had for him and thanks him for standing by his side until the very end. Toocie was her prize possession, the prince of her castle… her little side-kick. Every morning my mom woke up to her routine with her baby by her side - with every foot-step she took, he would follow right behind her just 4 paws away. There was never a morning that I wouldn’t hear the dishes being washed, followed by his meowing tunes to having a treat (which later turned into ‘mama’ at times – believe it or not), or wanting ice-cubes in his water bowl (thanks to me). She treated him no differently then having a child, she was willing to spend all the money in the world to keep her little guy happy… there is a reason Toocie had such a bond with her, because he knew what extremes my mom would take in order for him to be happy. In Toocie’s eyes, she was his mother, the sound of her voice, her delicate touch, and lastly, her soft kisses under his neck, all brought comfort to his little heart. As funny as this may sound, whenever I look into my mom’s eyes, sometimes I see a bit of Toocie in them. If there ever was a time he would show us the squinting ‘I love you eyes’ is when he looked at my mom. Ever since his passing, there are moments when my mom does that same wink… and I truly believe at times it is a gentle message from him looking back at us. For this, Toocie’s spirit will always be with us, and if there is ever a moment I start to feel unhappy, all I need to do is just look into my Mother’s eyes. A couple weeks before our baby’s passing, he began to distance himself and prioritized his day-to-day activity with bird 'watching' in the backyard. Little be told, we soon found a little bird brought to our door by Mr. Toocie. At first, my family didn’t know what to think of such a behavior, & we felt really sad for the loss of that bird. However, subsequently we later figured out that it was his way of bringing a gift to his owner. In my mind, it was Toocie’s way of saying thank you, thank you for giving me 8 years of unconditional love… my baby knew that his time was coming to an end. Saturday July 30th 2011 will be a day I will never forget, for it was a day of pure love and happiness my family and I got to experience with our little baby for the very last time. I truly believe it was Toocie’s goodbye. He put aside all his pain and focused all his energy into keeping us all together, filling his little room with tears of laughter, and a joy no words can explain. My mother, sister and I surrounded him with new toys and spent hours adoring his every move – Toocie gave himself to us, & my baby knew that night how much love he had over his roof. Bubs, you stayed with him that night until the next morning, slept on the floor beside him and he did nothing but get himself closer to you, to the point where you practically breathed FOR each other. This memory will forever remain with me. Aug 1st, 2011 - “All good things must come to an end” – the very next morning, our baby had let go…he secluded himself, and in my eyes, the message was for him to be at peace. That day, my sister lent me a pendant I had bought for her last summer… it’s an image of a flying bird. I wore it that day – there was a reason I chose that pendant. After days of not eating, hours of hard breathing, my family and I took Toocie to emergency. The good had officially come to an end… our baby was put to sleep… the heartfelt meaning of pain took over us that night, darkness had settled deep within us. I looked out the window, and asked God a few days ago to give me a sign that our Toocie is okay, and that we all made the right decision. I had asked this question while sitting in a cab, on my way to the airport. As I got to my gate, I took a look at my ticket, my seat number read ‘2C’… my baby was with us, he is happy and he loves us for sacrificing our pain for his ease and peacefulness. My pendant was his message, the bird to our door was his message – our Toocie is free. Let this reading remind us of all the good memories we had of you Toocie… we will ALWAYS love you. You are our angel now, watching over us, forever and always.